A new safe, easy-to-use product heals the ulcer while easing the pain. Chronic wounds are defined as wounds that do not heal within 4 weeks. 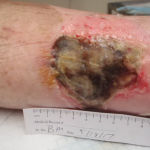 The Wound Healing Society classifies these wounds into 4 categories: pressure ulcers, diabetic ulcers, venous ulcers, and arterial insufficiency ulcers. Chronic wounds lead to serious morbidity and even mortality. Social isolation and self-neglect occur as some patients are embarrassed to seek care for a chronic wound. 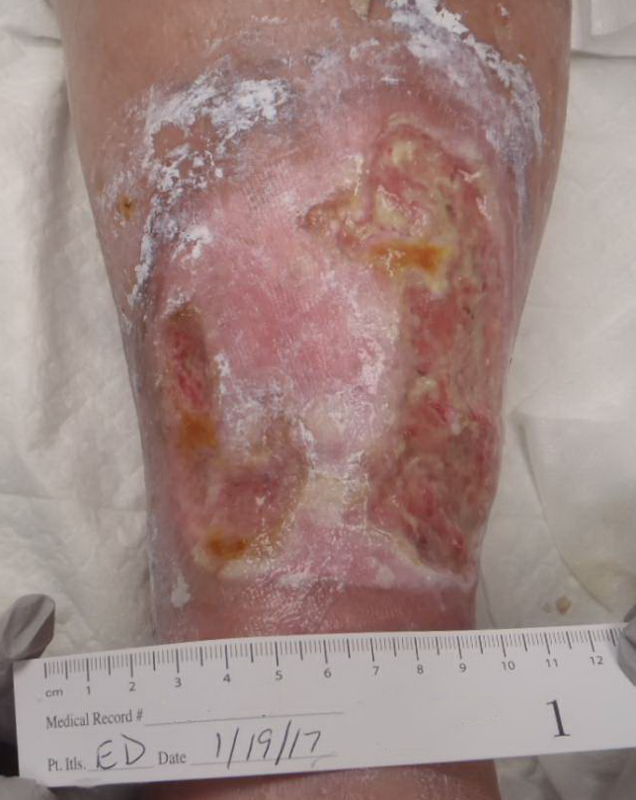 Complications include infection, gangrene, hemorrhage and even amputation. It is estimated that 1-2% of the population of developed countries will get a chronic wound at some point. These wounds cause a significant impact on quality of life in a number of ways, including loss of quality of life, depression, loss of function and mobility, anxiety and social isolation. In the U.S., 6.5 million patients per year will be treated for a chronic wound. The annual cost can be as high as 25 billion dollars for treatment of both the wounds and their myriad complications. Specifically, the significance of pain in the management of chronic wounds has been underestimated and undertreated. There are as many dressings and wound care products on the market as there are types of wounds, but one area has been overlooked by most pharmaceutical companies. Some of these wounds can be exquisitely painful. This pain can be constant, or it can be exacerbated by treatments like dressing changes and sharp debridement. Until recently, patients were forced to deal with this pain either with conventional OTC medications like acetaminophen or ibuprofen, or prescribed narcotics. 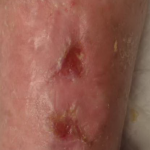 Most wound centers apply topical anesthetics to the wound bed prior to sharp debridement; however, if a wound is covered with thick adherent slough, the anesthetic gel cannot penetrate this layer to give adequate pain management. This may require the physician to perform a field block using an anesthetic such as lidocaine or bupivacaine injected in and around the wound bed. This can be uncomfortable for the patient because several injections may be required and the amide anesthetics, due to their basic pH, can sting significantly when injected as the block sets up. Bupivacaine 0.5% may be useful because although the injection process is uncomfortable, the block can last up to 8 hours or longer, giving the patient no pain after debridement at the wound center. However, because it takes longer to set up than lidocaine, the visit takes longer and slows the pace of the physician’s clinic. Astero (Gensco Pharma, Miami, Florida USA) is one of the few products currently available to solve many of these problems for podiatrists and wound care clinicians. Astero combines a hydrogel and a topical anesthetic (lidocaine 4%). Patients who present with thick, hard and adherent eschar on any type of wound and who have significant pain with debridement, or wound pain all the time, are excellent candidates for this safe, easy-to-use product. The hydrogel softens the eschar so the lidocaine can penetrate and ease pain. The hydrogel also maintains a moist wound healing environment. Up to 12 pumps a day can be administered directly to the wound bed. In patients who are in compression wraps for a venous leg ulcer who have pain with debridement, I recommend that they remove the wrap on the day of the wound care visit, shower, and then apply the Astero before coming to their wound care appointment. This way they are already “premedicated” with the topical anesthetic and they tend to tolerate sharp debridement much better. In this paper, I present two patients, both of whom benefited greatly from the use of topical Astero both before debridement and during the course of treatment. Neither patient knew the name of the product or the company that produced it. I simply called it a “pain gel” when I prescribed it to them. I supplied them with samples provided to me by the company for which I am on the medical consulting board. Neither I nor the patients received any monetary or material compensation during this study. Figure 1: Patient #1, initial wound center visit. Note large amount of yellow-green sough covering the wound as well as dried blood and old drainage. Patient E.D. was a seventy-six year-old female with a past medical history significant for peripheral vascular disease, hypertension, long-standing tobacco abuse (smoking 1 pack per day for greater than 30 years), poorly controlled type II diabetes mellitus, COPD, and obesity (BMI 39). 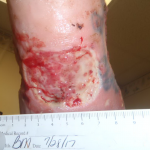 She developed a large, almost circumferential full thickness venous ulcer on the left anterior tibial area. When she first presented to me, the wound was covered with yellow green slough and was draining serous green drainage which smelled sweet (Figure 1). Her adult son came with her and stated that he had been trying to get her to seek treatment for months, but the patient was too embarrassed and did not want to leave her house or see anyone due to the drainage and the odor. The patient could not tolerate subcutaneous debridement with a derma loop curette or scalpel at all. She was exquisitely sensitive to pain in and around this area. 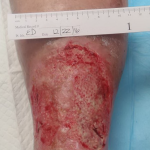 Her initial treatment plan consisted of soaking the wound with 0.25% acetic acid-soaked gauze for ten minutes with every dressing change, and then applying iodinated gel, an alginate, and highly absorptive dressings for drainage management. She was also started on oral Ciprofloxacin 500mg p0 bid for 14 days to empirically treat pseudomonas. Wound culture performed using the Levine technique subsequently grew pseudomonas aeruginosa sensitive to Cipro. Patient was also counselled to stop smoking. Since she had bounding pulses bilaterally in her feet and biphasic Doppler signals in the dorsalis pedis and posterior tibialis bilaterally, I elected to put her in a four-layer (ProFore) compression wrap for edema management. Due to the excessive amount of drainage, I arranged for visiting nurses to change the dressing once during the middle of the week and for her to see me weekly for serial debridement. On her second visit to me, I once again attempted to sharply debride the large amount of adherent slough and she was unable to tolerate the debridement. She confided in me that she had a history of prescription drug abuse after an orthopedic surgical procedure and was caught forging a prescription for Percocet. She did not want any narcotics, but simply could not tolerate the discomfort of debridement. For this patient, I opted to have her remove the wrap on the day of dressing change, shower, and then apply Astero to the wound bed. The visiting nurses reported that she was much more comfortable with dressing changes and she was finally able to tolerate the necessary debridement in the clinic. Figures 2 through 4 show the healing progression of the wound. Figure 2: Fourth Wound Clinic visit. Note how hydrogel effect of Astero has cleaned and softened the eschar to the point where it can more easily be debrided with less pain for the patient. 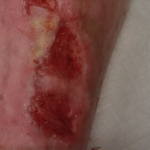 Figure 3: Note how wound is less than one-half the original size and a skin has formed in the center of the wound creating two distinct wounds. 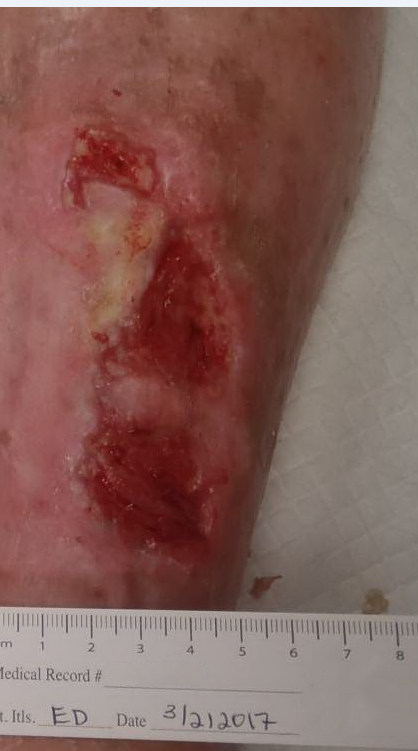 Figure 4: Wound went on to heal completely two weeks after this photo was taken. Figure 5: Patient #2, first visit. The wounds were large, completely covered in yellow slough and brown eschar and were malodorous and painful. 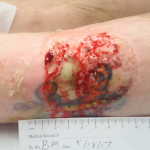 Figure 6: Note wound formed over skin that was previously tattooed. The second patient, B.M., was a sixty-eight year-old female who was referred by an outside hospital. 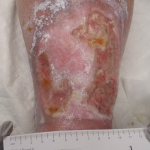 She developed 2 large, full-thickness bilateral nonpressure chronic ulcers during a recent hospitalization. On the first visit the wounds were large, completely covered in yellow slough and brown eschar and were malodorous and painful (Figures 5 and 6). This patient could not tolerate even a field block for anesthesia as she screamed and pulled away from the twenty-seven gauge needle used to administer the field block. During the first few weeks of treatment, she could not tolerate compression wraps due to pain. She was given Astero gel and told to administer up to 12 pumps a day. She was also taking narcotic pain medicine. She had a history of nontreated chronic venous insufficiency for which she never wore any compression garments or attempted any weight loss. She was a nonsmoker. She was a type II diabetic on insulin whose blood sugars were initially in the 170-200 range. She was working to decrease them with diet and medication adjustment post-hospitalization. Figures 7 through 9 show the healing progression of the wound. Figure 7: Notice less yellow slough and more pink bleeding granulation tissue present. Patient able to tolerate sharp debridement when pretreated with Astero thirty minutes before scheduled appointment. Figure 8: Note there is little to no slough remaining and the wound bed is moist, clean and almost completely filed with highly vascular granulation tissue. Figure 9: After two weeks additional healing. Both patients have subsequently gone on to heal these wounds completely. 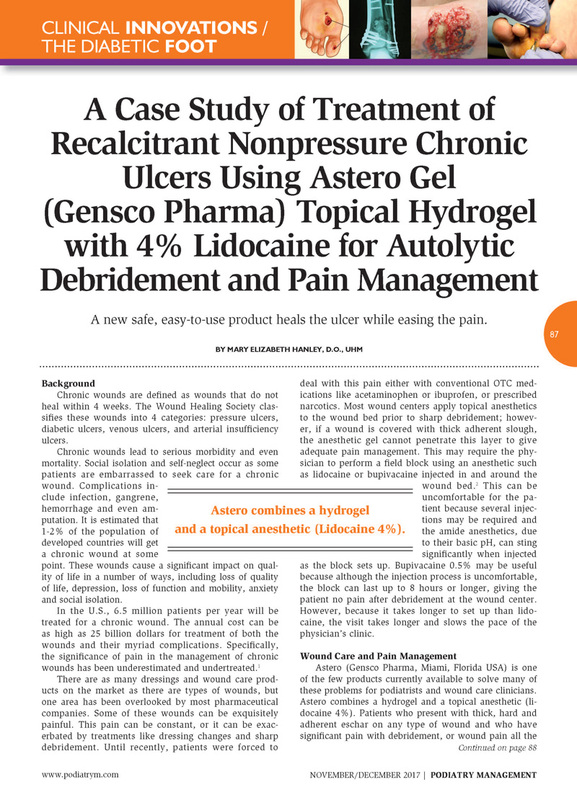 Both benefited from consistent compression therapy as well as serial debridement and, in my opinion, improved pain control through the use of Astero gel to the painful wound beds. As mentioned earlier, there is much in the literature to support that we tend to underestimate and undertreat the pain associated with chronic wounds. The opioid epidemic in the United States has made both patients and physicians hesitant to use narcotic pain medications. We know patients heal better when their pain is controlled, and their quality of life is also reported to improve. Astero is a topical, easily-administered pump gel that serves to provide a moist healing environment and the four percent lidocaine included in the gel is an effective and safe pain reliever when used as directed. Shukla, S., Tripathi, A.K., Agrawal S., Ansari, M., Rastogi, A., et al. Pain in Acute and chronic wounds: a descriptive study. Ostomy/Wound Management 2005, 51,11:47-51.